The Spanish property market was materially over valued and fell spectacularly following the GFC, causing significant damage to the Spanish economy. We recently spoke with Clay Smolinski about the similarities of the Spanish Property to the current state of the Australian property market, to determine whether investors can learn anything from the lessons of history. Italian Banking system - is this the source of the next crisis? Mark Draper and Shannon Corcoran (GEM Capital) recently met with Clay Smolinski to discuss the frail Italian Banking system, and to determine whether it will be at the epicentre of the next crisis. Is Telstra good value after the dip? Telstra (TLS) is not high on the list of businesses we would most like to own. Having said that, it is not a terrible business, and at the right price it makes sense to own it, particularly given its steady dividend stream. So, with TLS’s share price down around 20 percent over the past year, we decided to assess its value. One of the appealing features of TLS is its stability. Over many years, the company has delivered consistent revenues at consistent margins for consistent earnings. On the face of it, this should allow us to value the company fairly readily. However, for several reasons the future for TLS looks different to the past: Firstly, migration to the NBN will take a large bite out of TLS’s fixed-line business, offset somewhat by a series of one-off and recurring payments it will receive from NBN Co. for handing over its copper and HFC networks. Secondly, there is the matter of TPG Telecom (TPM) planning to become Australia’s fourth mobile network operator. 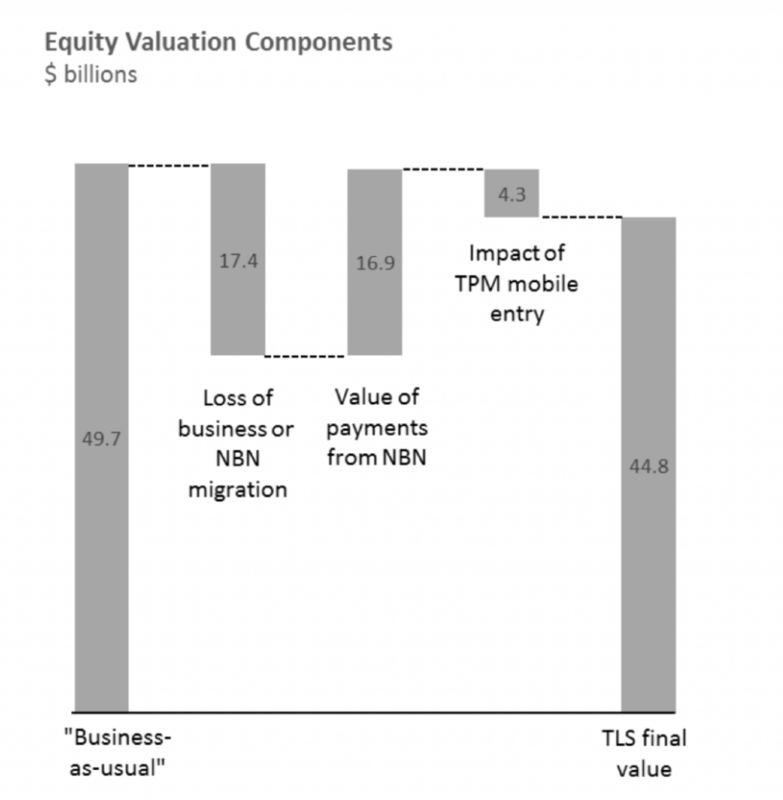 A “business-as-usual” valuation of TLS based on historical financial metrics; A valuation of the earnings “hole” left by the migration to NBN; The present value of payments TLS will receive from NBN Co; and An adjustment for the impact of increasing competition in mobile. We consider each of these in turn. As noted above, TLS has historically been a very stable business, and the “business-as-usual” valuation is a relatively straightforward extrapolation of historical financials. Using an 8% cost of capital and a 1.5% p.a. growth rate, we arrive at an estimated value of just under $50 billion for the equity in TLS, or around $4.20 per share. We then come to the NBN earnings hole. TLS has provided guidance as to the EBITDA impact it expects when the migration is complete, and our “business-as-usual” valuation gives us an implied EBITDA multiple with which we can capitalise this impact. We estimate that this amounts to a fairly meaningful $17.4 billion of equity value, equivalent to around $1.46 per share. Happily, this earnings hole is largely compensated for by one-off and recurring payments it expects to receive from NBN Co. TLS has provided estimates of the value of these payments, but we believe the discount rate applied to these payments should be lower than the one TLS has used (which is generally 10%). We have evaluated TLS on the basis of an 8% WACC, and we see these payments as having somewhat lower risk than the overall TLS business, and so we apply a 7% discount rate. On this basis, we estimate the value of payments yet to be received from NBN Co at around $16.9 billion after tax – a larger figure than quoted by TLS, and one that substantially makes up for the value lost from TLS’s fixed line business. Finally, we consider the impact of TPM’s entry into the mobile market. As a point of reference, we note the impact of the 2012 entry into the French market by low-cost operator, Free mobile. In that example, ARPUs for the leading player, Orange, declined by 10-15% over several years, as the new entrant moved to take market share of 15%. Free benefitted from a roaming agreement with Orange. However, the ACCC has indicated it does not support roaming in Australia. This is an important constraint on TPM which plans to spend relatively little on its network build and will achieve relatively limited population coverage; Approximately 53% of TLS mobile subscribers are outside the major cities, and therefore less vulnerable to competition, as TPM focuses its network spend on the major cities; A large part of TLS’s mobile revenues are derived from business subscribers, who would also be less susceptible to a TPM offering; and Across its entire customer base, TLS maintains a price premium position in the Australian market due to perceptions of coverage and quality. TPM’s low-cost offering will more directly impact Optus and Vodafone (and is thought to potentially be a strategy to pressure Vodafone into a consolidation). Taking these factors into account, we anticipate a couple of percentage points of lost market share for TLS, and perhaps a 5% decline to ARPUs. 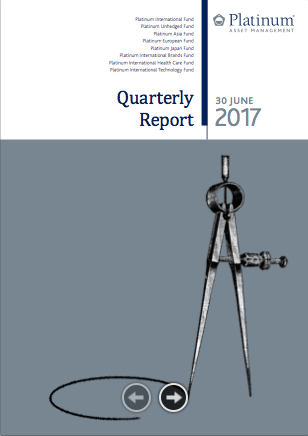 On this basis, we estimate that the value of TLS falls by around $4.3 billion, or around $0.36 per share – still a material impact. We then assemble the different valuation components into an overall picture, as follows, to arrive at an estimated value for TLS equity of around $44.8 billion, which equates to around $3.77 per share. Against today’s share price of $4.42, this makes TLS look around 15% expensive, although it should be noted that we consider large sections of the Australian equity market to be expensive, so this conclusion perhaps comes as no surprise. It is also worth noting that different judgements around discount rates might lead other analysts to a different conclusion. The Montgomery Alpha Plus Fund – which is fully-invested and uses a machine learning model analysing many different variables to drive investment decisions – holds a modest position in TLS in its long portfolio. For the Montgomery Fund, however, we are particular about valuation and are happy to hold cash when value is scarce. Accordingly, TLS does not find its way into our long-only funds at the current price, regardless of its dividend-yielding appeal. Perceived political risks in Europe have detracted from European equity performance over the past year, with around US$100bn flowing out of European markets in 2016. With the election of Emmanuel Macron as the next French President, much of that risk has been reduced and investors may now focus on the performance of European companies. Here we look at the key benefits that the Macron win may bring to the European economy and its equity markets. Macron is a reformist and pro-European. He is in favour of greater integration in Europe, the strengthening of European institutions and a common Eurozone budget that would protect from future economic shocks. He has campaigned on reforms of the labour market in France, reforms of the tax system and tax cuts, and raising the retirement age, which is currently one of the lowest in Europe. Along with this, he plans to invest EUR50bn into the French economy. This would be funded by reducing the size of the French state - by far the largest of any European country. All of this would be hugely beneficial to what is a relatively uncompetitive French economy, and to the future strength and stability of the Eurozone. Sentiment towards Europe has been particularly strong since the first round of voting in France two weeks ago, seeing European and French markets up 7-8%. With either the upcoming UK or German elections representing an existential risk to Europe, much of the political risk is behind us. Investors will likely focus on corporate fundamentals and earnings. Since the financial crisis, while US companies have seen margins and earnings recover, European earnings are still below their peak. The underperformance of European stocks relative to US stocks has been exclusively driven by the lack of earnings delivery of European companies. Source: Fidelity, Datastream, Morgan Stanley , data as of 6 Apr 2017. N12M ERR (%) = 12-month earnings revision ratio. 3MA = 3-month moving average. What we are now seeing is a strong recovery in European stocks, with earnings starting to come through. Margins are recovering and the most recent earnings season in Europe has been the strongest in more than 10 years. Particularly compelling for European equities is their valuation. As they have been out of favour for much of last year they are trading at a multi-year discount relative to the US on a price-to-book basis. And today, record high numbers of European companies have a dividend yield that exceeds their bond yield. Source: Datastream, GS Research, data as of 31 March 2017. Source: Datastream, Goldman Sachs Global ECS Research, December 2016. Stoxx Europe 600. Europe has been significantly out of favour for some time due to political risk. The French result today puts much of this behind us and European equities are looking attractive compared to the US and other markets and asset classes. We are now starting to see companies deliver strongly on earnings, removing another key detractor from investor sentiment. This document is intended for use by advisers and wholesale investors. Retail investors should not rely on any information in this document without first seeking advice from their financial adviser. You should consider these matters before acting on the information. You should also consider the relevant Product Disclosure Statements (“PDS”) for any Fidelity Australia product mentioned in this document before making any decision about whether to acquire the product. The PDS can be obtained by contacting Fidelity Australia on 1800 119 270 or by downloading it from our website at www.fidelity.com.au. This document may include general commentary on market activity, sector trends or other broad-based economic or political conditions that should not be taken as investment advice. Information stated herein about specific securities is subject to change. Any reference to specific securities should not be taken as a recommendation to buy, sell or hold these securities. While the information contained in this document has been prepared with reasonable care, no responsibility or liability is accepted for any errors or omissions or misstatements however caused. This document is intended as general information only. The document may not be reproduced or transmitted without prior written permission of Fidelity Australia. The issuer of Fidelity’s managed investment schemes is FIL Responsible Entity (Australia) Limited ABN 33 148 059 009. Reference to ($) are in Australian dollars unless stated otherwise. Successive Australian governments are usually judged on how they balance the budget and spend taxpayers’ dollars. The stereotypes are that Liberal governments keep a tight hold on the purse strings, while Labor governments are spendthrifts. While total government spending has increased from around A$240 billion in 1998-99 to a predicted A$451 billion in the 2016-17 financial year, it’s also accompanied by an increase in revenue from around A$250 billion to A$417 billion over the same period. But the pressure on the budget under a Turnbull government is more acute now than ever before, because spending is outpacing revenue. It’s now at an estimated 26.6% of GDP in 2016-17, higher than at any point since before the start of the millennium. When you look at the mix of government spending over the past fifteen years, you start to see some of the drivers of the growth. To compare spending over time, we have adjusted for the effect of inflation by using real measures. Social security continues to dominate government spending at A$161.4 billion, constituting around 35% of all government outlays on latest figures. This has fallen from a high of 39% during the Rudd government stimulus package in 2009-10 and is similar to levels at the beginning of the millennium. In the graph below “other” spending includes the distribution of GST revenues to states and territories as well as spending in areas such as job seekers assistance, industrial relations, vocational training, tourism and immigration. This constitutes the second highest share of government spending, at 18% (A$83.4 billion) of the total spend. 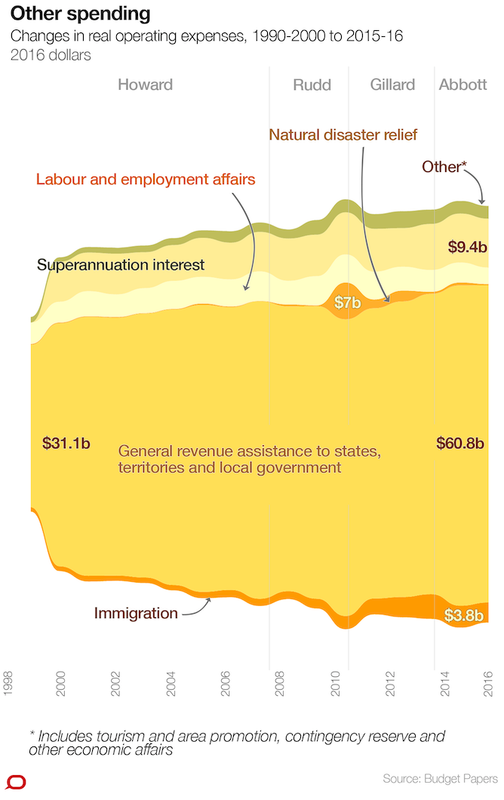 General revenue assistance to states and territories accounts for two thirds of spending in this category. Governments spend almost as much on defence and public safety (around A$32.6 billion) as they do on education (A$34.3 billion), although the states ultimately pick up most of the education bill. 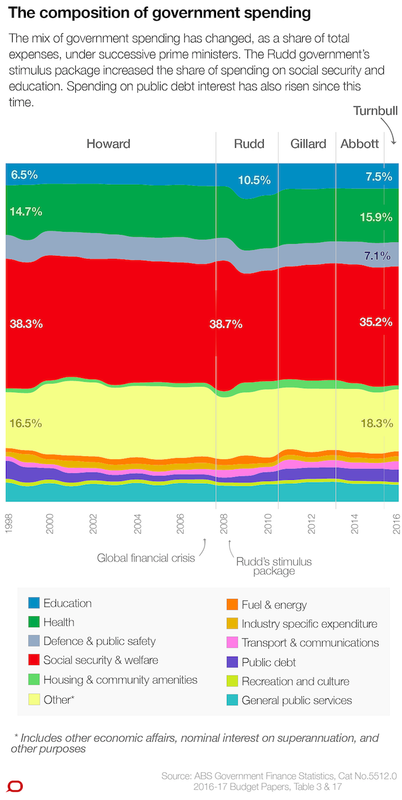 The global financial crisis saw a temporary blip in the mix of general government spending. Social security spending rose by 22% in the year to June 2009, and education expenditure jumped 60% a year later as a result of Rudd’s economic stimulus package. Government spending on public debt interest has more than tripled in real terms to A$15.4 billion since the start of the global financial crisis, and now accounts for 3.7% of all government spending. Many of the changes in real government spending between 2008 and 2010 were driven by the impact of the global financial crisis, which resulted in a slowdown in economic growth, rising unemployment and a negative hit on the sharemarket. 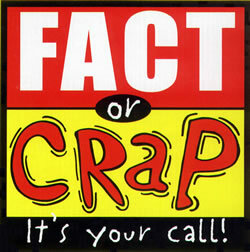 The Rudd government response was a stimulus package. The main spending increases came from a combination of accelerating public debt interest, increased payments to assist the unemployed, but mainly the government’s stimulus measures channelled through increased spending on education, housing and cash payments to families. If a spending measure is truly temporary, a rise in real spending should be followed by an equivalent fall in subsequent years when the spending runs out or the program ends. This is evident to some degree for the social security and welfare and fuel and energy portfolios, but less so in other areas. For example, the 45% rise in fuel and energy spending in 2008-09 was primarily driven by the introduction of the Energy Efficient Homes package within the Rudd stimulus suite. The scheme ended in February 2010, resulting in a 33% drop in spending. 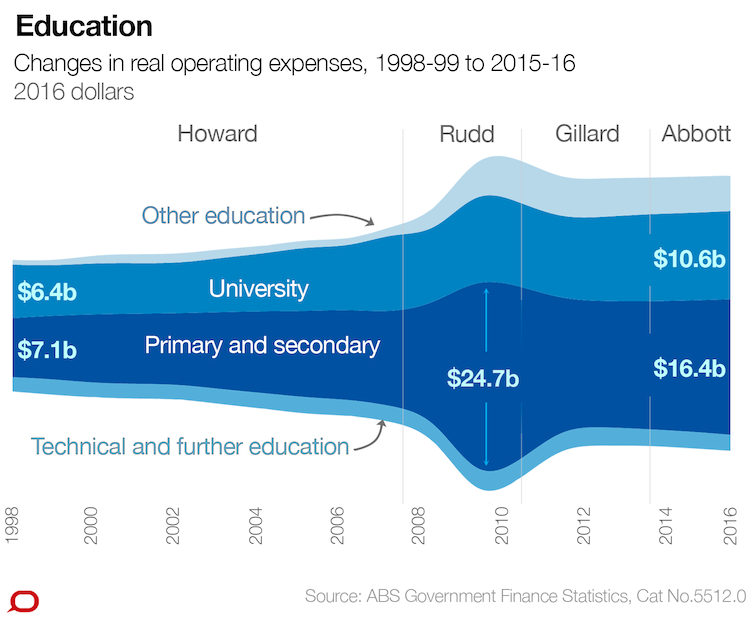 On the other hand, spending on education rose by A$16 billion as part of the Rudd stimulus package, but remained A$10 billion higher than pre-global financial crisis levels in subsequent years. Overall government spending has continued to grow since 2010-11, but less dramatically than during the heart of the global financial crisis, by around 8% in real terms over the five years to 2015-16. Social security and welfare spending constitutes the largest spending commitment of any government budget. It has risen by 70% in real terms over the past fifteen years, from A$91 billion at the turn of the millennium in 1999-00 to A$155 billion in 2015-16. The biggest welfare spending is for assistance to the aged, families with children and people with a disability. Together, these three items make up almost 85% of all welfare spending. The 2008-09 Rudd stimulus package had a substantial yet temporary effect on welfare spend, with “bonus” cash payments to families in the 2009 calendar year increasing assistance to families by around A$10 billion. Additional cash payments were also made to students, pensioners and farmers under the stimulus program. And 8.7 million Australian workers earning $100,000 or less also received a cash payment. Australia’s ageing population and increases in both disability prevalence and disability support are the main driving forces behind welfare spending growth. These factors will continue to exert pressure on future government budgets, especially with the full rollout of the National Disability Insurance Scheme (NDIS). More than 40% of the government’s 2015-16 health budget of around A$71.2 billion was committed to community health services spending. At A$28.7 billion, spending in this sector has nearly doubled since the start of the millennium and by a quarter since the start of the global financial crisis in 2008-09. This stems from the need to deliver medical services to a growing – and ageing – population, and the increased prevalence of chronic disease. In this respect, Australia is little different to most countries around the world. Specific measures contributing to this growth included the expansion of health infrastructure, the costs of enhanced primary care attracting higher Medicare rebates, and indexation of health related payments to states and territories. Pharmaceutical spending increased by 12%, from A$1.4 billion year-on-year to A$12.1 billion in 2015-16. Education spending rose dramatically during the global financial crisis, with spending on primary and secondary education increasing 81% to A$24.7 billion in the year to 2009-10 as part of the economic stimulus package. Rudd’s “education revolution” led to a 12% growth in education spending in the 2008-09 budget, quickly followed by a further 61% spending increase in 2009-10 as part of the economic stimulus package. Spending in the following year fell as the temporary stimulus measures came to an end, but overall, education spending has remained significantly higher in real terms than pre-global financial crisis levels. Spending on the university sector rose to around A$10.9 billion over the same period, but has remained relatively stable since. The federal government committed A$60.8 billion in general revenue assistance to states and territories in 2015-16, almost all of which came through the distribution of GST revenue. General revenue assistance spending rose A$3.8 billion in real terms in 2014-15, up 7% on the previous year, but has since stabilised. Spending on superannuation interest has grown by a quarter since the end of the Howard years, reflecting the increase in the government’s superannuation liability. 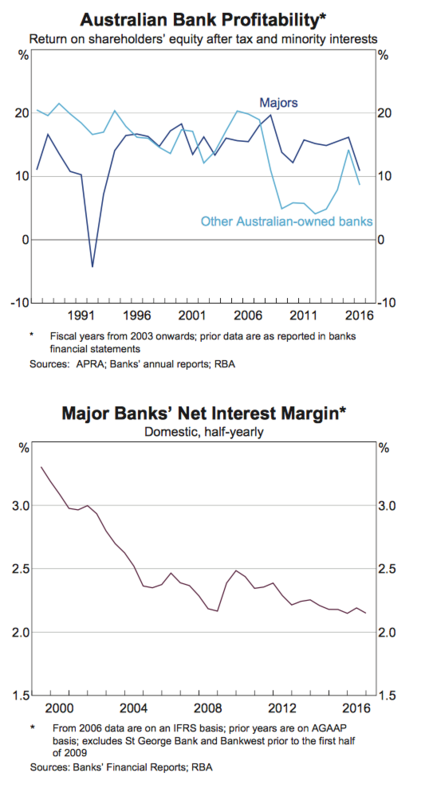 Lower public sector wages and employment have led to superannuation interest payments stabilising over the last two budgets to around A$9.4 billion in 2015-16. Immigration spending rose between the Gillard and Abbott governments to a peak of A$4.7 billion in 2013-14, but has since fallen back to around A$3.8billion in 2016 dollars. Much of the growth in immigration spending occurred during the Rudd and Gillard governments, by an average of 23% annually. This compares to an average of 7% during the previous Howard years. Additional government spending on detention facilities for irregular arrivals was the principal reason for this spending growth. Natural disaster relief spending spiked between 2009 and 20-11 to assist with the damage and recovery costs from the Black Saturday bushfires in Victoria in 2009, and the 2010 Queensland floods. Government approaches to supporting various industries has typically been applied on an ad hoc basis. Budget spending on specific industries has risen from A$3.2 to A$5.6 billion in real terms. 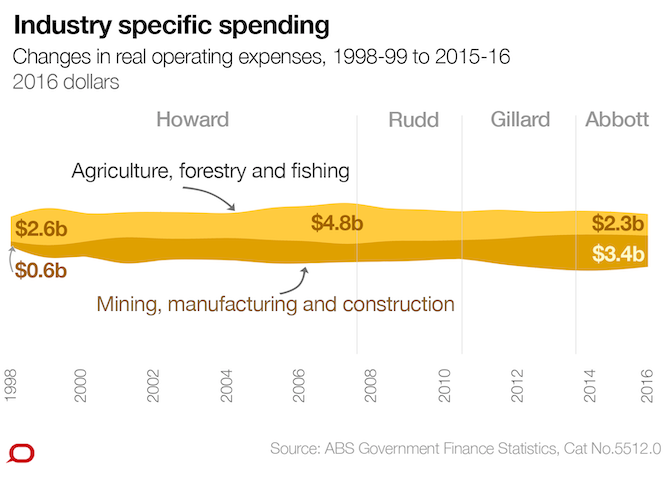 Agriculture, forestry and fishing typically received a greater share of industry spending during the Howard budgets, reaching a high of A$4.8 billion in Swan’s final 2007-08 budget. Growth in industry spend slowed during the Rudd years, picking up again with the Gillard and Abbott governments, with a greater preference towards spending in mining, manufacturing and construction projects. Spending on housing and community amenities has increased from A$2.7 billion to A$7.6 billion, reaching a high of almost A$12 billion in the Rudd years. Spending in this portfolio increased with the Rudd stimulus package, incorporating a number of housing affordability measures including the First Home Buyers Grant Scheme and a boost in investment in social housing. 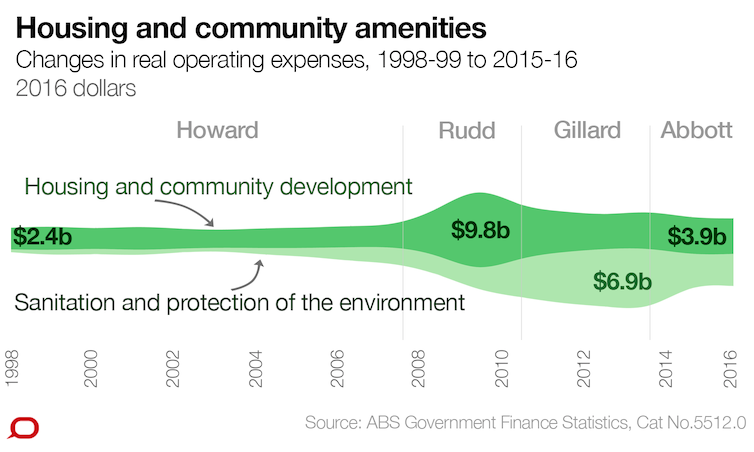 Spending on sanitation and protection of the environment also expanded rapidly during the Rudd/Gillard government, relative to the Howard years. 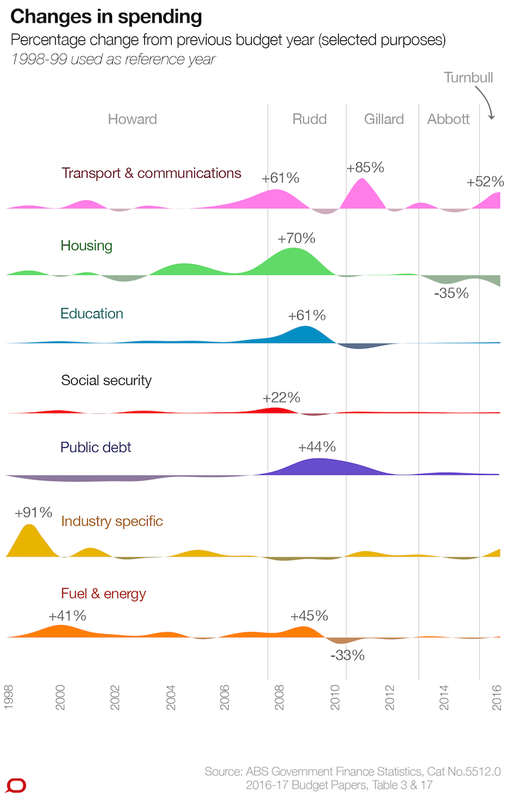 The establishment of the Climate Change Action fund introduced by Rudd in 2009-10 and the Clean Energy Futures package in 2010-11 have been the main drivers behind this increase. 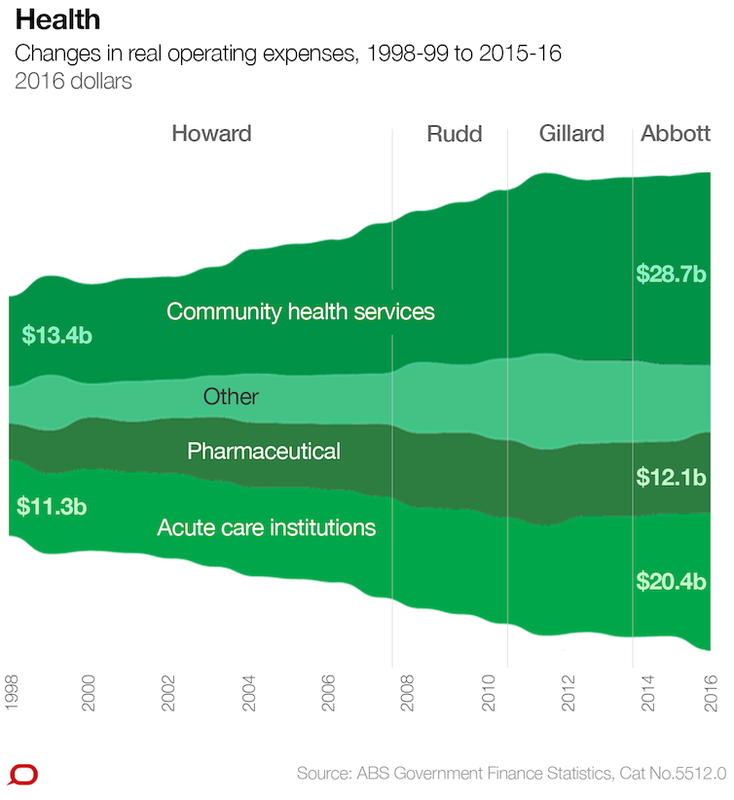 Spending in each has been pared back since the Liberals came to power with Abbott at the helm. Commonwealth spending on transport and communications projects has more than doubled from A$3.1 to A$7.5 billion over the last 15 years. 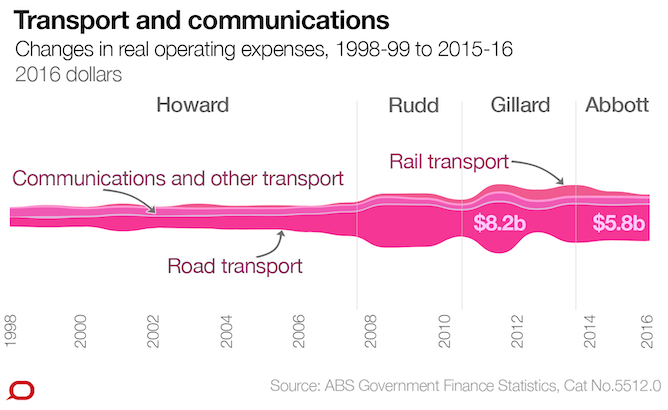 Spending remained relatively stable under Howard’s government, and then got a further injection on roads in the last two Swan budgets. The Rudd government continued this trend, with Gillard following suit with increases in both road and rail projects. Spending in this portfolio has been clawed back since the Abbott government, falling from A$9.2 billion to A$7.8 billion between the final Labor government budget (2013-14 financial year) and the first Liberal government budget (2014-15 financial year). The most recent Turnbull/Morrison budget has reaffirmed spending commitments under this portfolio, committing to more than A$11 billion in 2016-17. The Howard/Costello years were characterised by good economic times, with an extended period of strong revenue growth, yet this prosperity wasn’t matched with any significant spending growth. In fact, overall government spending fell as a share of GDP – from 25.7% in 2000 to 23.6% in 2006-07 – the lowest share since the start of the millennium. And the combination of strong revenue and limited spending commitments under Howard drove down public debt, and public debt interest payments. We saw some pretty dramatic increases in real spending when Rudd came into power in December 2007. Rudd’s first budget in 2008-09 saw some substantial spending commitments in the area of education but nothing exorbitant. However, the major turning point in government spending has been driven by the response to the global financial crisis. There were significant spending commitments over the course of the crisis, some of which are still present. Spending on public debt interest has increased to A$15.4 billion since the global financial crisis - more than the spending on transport and housing combined. And it’s projected to increase further to A$18.7 billion by 2019-20. This just emphasises how high the stakes are for Scott Morrison in delivering a credible budget repair strategy. The spending of incumbent governments inevitably draw from the commitments of previous administrations, especially for those programs – in infrastructure, education or housing - that involve medium-term funding commitments. The growth in real spending in areas that directly affect households – social security, NDIS, health or pensions - is an issue that no government can ignore. NDIS costs have been hugely underestimated already, and social security and health spending will inevitably increase with the ageing population. Set against this context, it’s clear that a piecemeal approach to budget repair is unsustainable. A drop in revenue has ramped up budget pressures, and highlights the compelling need to return to a sustainable spending path and a credible budget repair strategy. The Turnbull government cannot shy away from making the big decisions that secure a sustainable future for Australia. And the roadmap towards a sustainable future has to include revenue as well as spending as part of the recovery narrative.